Recorded for the Blue Note label in 1964 at Rudy Van Gelder’s Englewood Cliffs, New Jersey, studios, and released in 1966, the album Speak No Evil was Shorter’s sixth and certainly one of his most important. A member of and the chief composer for the Miles Davis Quintet (Davis’s “second great quintet”) at the time of this recording, the saxophonist engaged the services of Davis bandmates Herbie Hancock (piano) and Ron Carter (bass), along with drummer Elvin Jones, with whom he’d recorded previously, and trumpeter Freddie Hubbard, an earlier bandmate in Art Blakey’s Jazz Messengers. The group was a simpatico one, as listening to the album attests manifestly. Growing up in Newark, New Jersey, Wayne Shorter, at the age of 15 (that would have been 1948), reportedly snuck into a Lester Young concert, where he heard some of the era’s most innovative jazz musicians, among them Dizzy Gillespie and Charlie Parker, an event that provided the direction of his life. Soon young Shorter took up clarinet, not long thereafter replacing it with the tenor saxophone, his primary instrument from then forward. After graduating college, Shorter continued to follow his passion for the music by visiting the jazz clubs in Manhattan and even practicing with John Coltrane. After a two-year stint in the Army, he returned to pick up his horn again, soon joining Art Blakey’s Jazz Messengers, a group that was a known incubator of rising jazz artists of the hard bop ilk. During his four years with Blakey, he became the group’s musical director. The young man’s talents did not escape the notice of Miles Davis, who in 1964 was creating a new Miles Davis Quintet, as John Coltrane, Paul Chambers, Red Garland and Philly Jo Jones—the members of Davis’s first great quintet—were moving on. Davis recruited Shorter to the quintet, and he stayed with Miles for six years, during which time, as the quintet’s chief composer, he contributed originals to the group’s repertoire that included “Nefertiti,” “Pinocchio” and “Footprints,” among others, many now considered modern jazz classics. Speak No Evil, as noted, was recorded at the same time Shorter was playing in and writing music for the Davis quintet. But here he was composing for himself. And what we hear in this music is a more deeply lyrical Wayne Shorter, one employing rich harmonics and unorthodox tune forms (something of a Shorter trademark). He wrote six new compositions for the session, music that reflects both the hard bop of his Blakey years and the modal jazz that Miles and Coltrane had been exploring. Considered a musical descendant of both John Coltrane and Sonny Rollins, Wayne Shorter does indeed reveal the influences of the masters who preceded him. But clearly he has emerged at the time of this recording with his own voice and approach to improvising, an approach that shows a respect for open space in the music. Shorter told Don Heckman, who wrote the album’s original liner notes, that he was “thinking of misty landscapes with wild flowers and strange, dimly-seen shapes—the kind of place where folklore and legends are born. And then I was thinking of things like witch burnings too.” The darkness, the eeriness—it’s all in here. 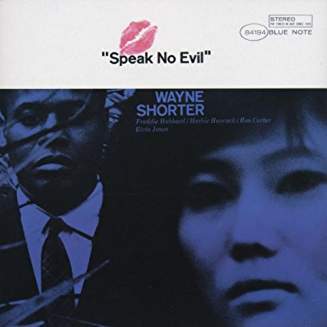 Interestingly, the album Speak No Evil received little fanfare at the time of its release, but over time it has risen in critical estimation and is considered by many Wayne Shorter’s finest album. For a novice collector of modern jazz who has yet to acquire a Shorter album, this is an excellent place to begin. And if you like what you hear, go back to some of the saxophonist’s earlier work (his Blakey years), then go forward to his recordings with the group Weather Report, the fusion band he launched with pianist Joe Zawinul, and his recordings with VSOP, the group that includes the same personnel as Speak No Evil, but with Tony Williams replacing Elvin Jones on drums. Wayne Shorter is a nine-time Grammy winner and continues to perform, often with old friend Herbie Hancock.